Sabrina McMurray, center, with residents of Glennwood House, is contributing a slice of this month’s pie sales to the facility. 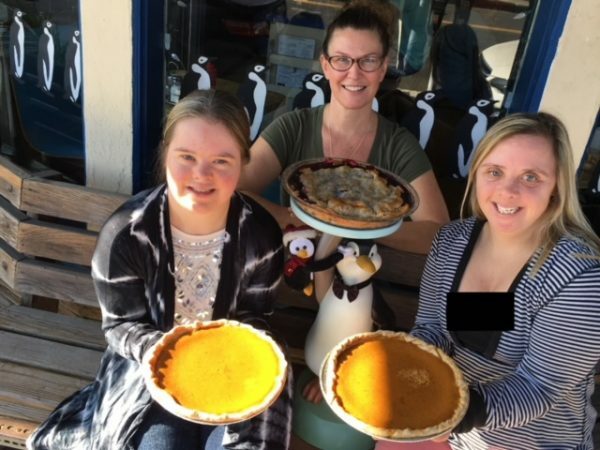 Sabrina and Michael McMurray, owners of Penguin Café, 981 S. Coast Highway, will donate 30 percent of their sales from 10 a.m. to 1:30 p.m. on Saturday, Jan. 20 and 20 percent of all pie orders this month, they said in a statement. Freshly made pies must be ordered 24 hours in advance of pick up by calling 949-494-1353. The recipient of their generosity is Glennwood House, a residential facility for 47 adults with intellectual and developmental disabilities. 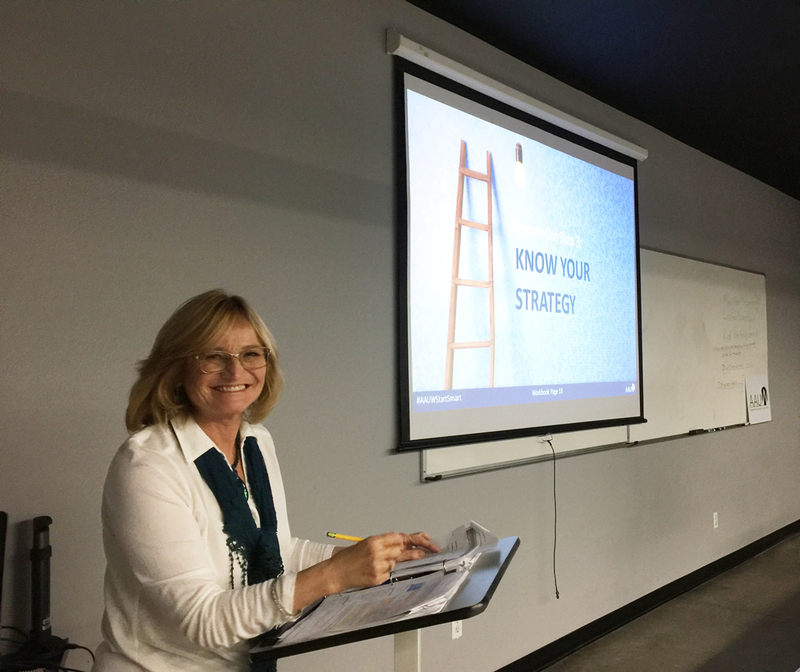 Lesley Danziger will lead the Start Smart workshop, providing training to women on salary negotiations. Persuasive tips and tactics to use in salary negotiations will be offered during an American Association of University Women workshop from 3-5 p.m. on Sunday, Jan. 28, at the Laguna College of Art and Design. Lesley Danziger, chair of the Start Smart workshop, will conduct exercises and offer negotiating times. The program will be held in Studio 1 at LCAD, 2222 Laguna Canyon Rd.. Parking is free and refreshments will be served. Questions: Contact Madeleine Peterson at 949 376-8494 or visit the AAUW-LB website. Training for volunteer tide pool docents will be held on from 5-7 p.m. Tuesday, Jan. 23, at the Ocean Institute, 24200 Dana Point Harbor Drive, Dana Point. 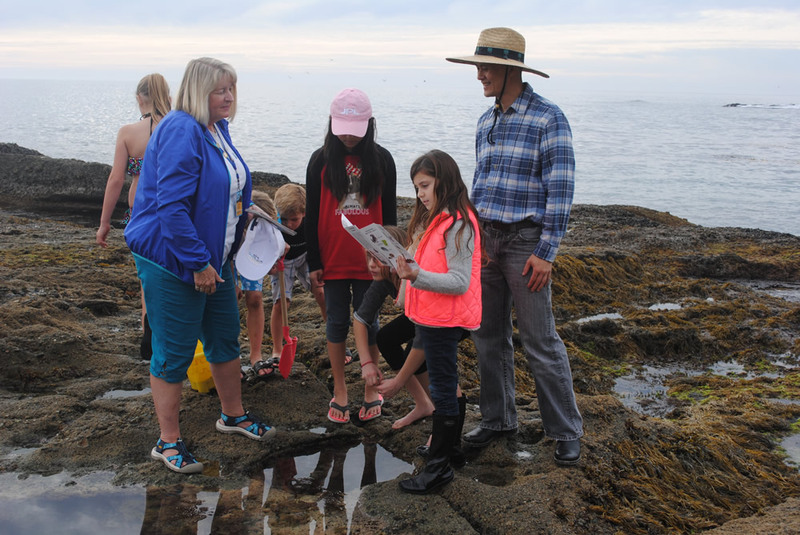 Docents are required to be at least 18 years of age and volunteer at the tide pools at least once monthly within the Laguna Beach Marine Protected Area at Crescent Bay, Shaw’s Cove, Woods Cove or Goff Cove. For information contact Letty Skeen, Tidewater Docent Coordinator at [email protected] or call 949-400-6032. Docents help preserve tidepool habitat by educating beach visitors. The 30th birthday bash for Shanti OC, which offers assistance to the HIV community, will include honoring retiring executive director, Sarah Kasman, as well as welcoming a new executive director and board members. The $125 per person event takes place Sunday, Jan. 21, from 5-8 p.m. at Seven Degrees, 891 Laguna Canyon Rd. The evening will include guest speakers Dr. Charles Garfield, who created the Shanti service model, and City Council member Toni Iseman, a long-time Shanti supporter and former mayor of Laguna Beach. Reservations are due Monday, Jan. 22, for the brunch celebrating Patriots Day Parade honorees. The Sunday, Feb. 4, brunch is scheduled for 11:15 a.m. to 1:15 p.m. at Tivoli Terrace on the Festival of Arts grounds. Honorees for the March 3 parade are Grand Marshal Gloria Fickling, Honored Patriot George Ciampa, Citizen of the Year Heidi Miller, Junior Citizens Marisa Schatz and Joseph Ravenna, and Athletes of the Year, Junior Olympic water polo champions. The cost is $30 per person. More details: [email protected] or phone 949-494-6016. The Jewish Collaborative of Orange County continues its Fridays in Laguna musical Shabbat service with Rabbi Marcia Tilchin and musician and radio personality Jason Feddy. Experience two different environments on the fourth Friday of each month: the 6 p.m. service followed by dinner at Mozambique Restaurant, 1740 S. Coast Highway, scheduled for Jan. 26 and Feb. 23, or a more intimate celebration in a private home, set for March 23. Cost is $42/person and $15 for ages 12 and under. Sign up at: jewishcollaborativeoc.org. 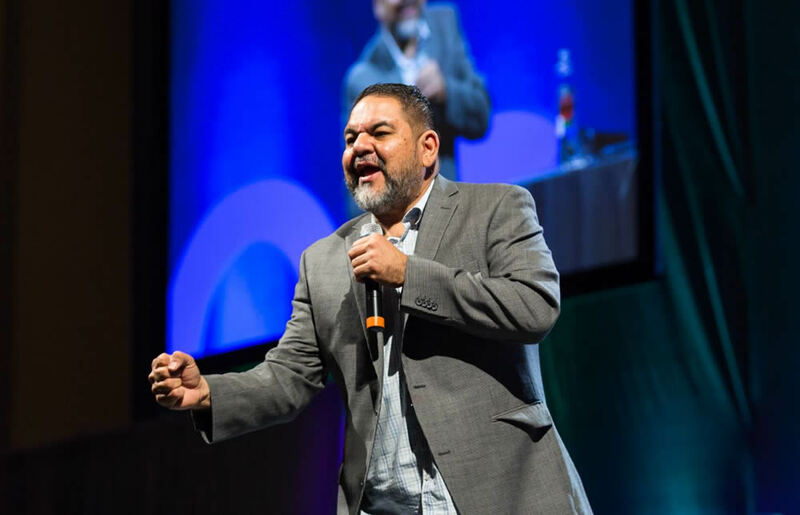 The annual mayor’s lunch, this time honoring Toni Iseman, will be held at the Woman’s Club, 286 St. Ann’s Dr., Friday Feb. 2 at 12 p.m.
TED Talk guest Ray Lozano is one of the featured speakers in the Date Night series. A three-part dinner series for teens and their parents will be offered as part of Mission Hospital’s Date Night program beginning at 6:15 p.m. on Tuesday, Jan. 23 at the Susi Q Center, 380 Third St.
Each of the evenings will focus on different topics intended to empower young people to lead a healthy lifestyle while arming parents with skills to help them. The series for ages 11-15 and their parents is $45 and includes dinner. Chabad Laguna Beach will offer Jewish Learning Institute’s new six session course, Communication: Its Art and Soul, beginning at 7 p.m. on Wednesday, Jan. 24. This course is designed to appeal to people at all levels of knowledge, including those without any prior experience or background in Jewish learning. All JLI courses are open to the public, and attendees need not be affiliated with a particular synagogue, temple, or other house of worship. Interested students may call 949 499 0770 or visit www.myJLI.com for registration. Chabad is located at 30804 S. Coast Hwy. A free, five-week citizen awareness program for residents to learn about city operations and how to participate in civic affairs starts in March. Sessions will take place every Thursday in March from 7 -9 p.m. Each session will cover various aspects of local government and feature presentations from local government leaders. Online applications are available at: lagunabeachcity.net/leadershiplaguna. The city of Laguna Beach is now accepting applications for the community assistance grant program, which assists local non-profit organizations in funding new projects and or expanding services within the community. Grant applications, due by 5:30 p.m. on Thursday, March 29, need to be submitted electronically, an announcement from the city manager’s office said. Experts will suggest ways to improve health by tackling dangers created by extreme weather and increasing air pollution on Sunday, Jan. 21, 1:30-4:30 p.m. The forum takes place at Kaiser Permanente offices, 6650 Alton Parkway, in Irvine and is sponsored by the Sierra Club. Hear from a local pediatrician, a UCI scientist and local activists and organizers about what community action. Speakers include Dr. John Winkelman, pediatrician of St. Joseph Heritage Medical Group; James Randerson, UCI earth science professor; Robin Ganahl, of Mothers Out Front, speaking about methane leaks. Women’ March organizers Paola Mendoza, Sarah Sophie Flicker, and Jenna Arnold will speak to supporters and sign their book “Together We Rise” at 6:30 p.m. Monday, Jan. 22, at a private home in Laguna Niguel.